Senior Principal Gregor Markel and Associate Ben Simonson will lead a 2018 CCBA Tap Talk on How to Successfully Identify or Develop a New Facility. When your success outgrows the capacity of your facility, what you may not know about developing a new facility or leasing an existing facility can hurt your business. Following a set of key best practices for due diligence and for how you should work with cities will go a long way in minimizing unnecessary growth pains. Speakers will address: How to create a master budget for your project; How to conduct due diligence on potential locations; and How to identify your development team. 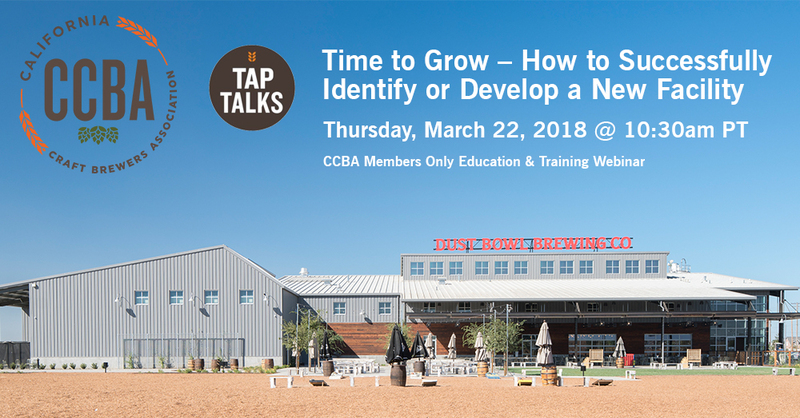 TapTalks are a new California Craft Brewers Association (CCBA) webinar series, designed as educational seminars with tangible takeaways for the brewing industry audience, providing valuable educational content for CCBA members. Topics range from the stories behind successful breweries to close looks at the why and how of popular brew types.